As offshore oil and gas reserves become ever more difficult and costly to recover, the demand for innovative technology has never been greater. 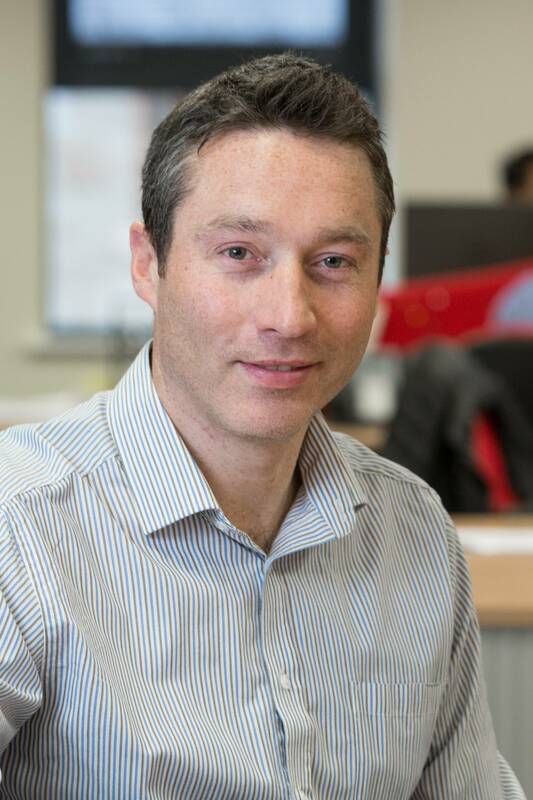 Joe Orrell, managing director at RED Engineering, considers some of the challenges in subsea infrastructure design and the role of fast track engineering solutions. The offshore oil and gas industry, even in times of low prices and abundant supply, is driven by the almost relentless search for new fields to replace those coming towards the end of their natural productive lives. Often this forces exploration in ever more challenging environments and places huge demands on the boundaries of technology. And these challenges are no better exemplified than in the design and construction of subsea flowline infrastructure in very deep waters, where operators strive for ways to shorten project lead times to reduce both development costs and the time to ‘first oil’, which is critical in terms of project cash flows. This has demanded innovation in both technology and working methodology – necessitating close working partnerships with clients and the supply chain alike. Deepwater flowline infrastructure takes many different forms and configurations but a universal demand is for methods to retain position relative to vessels, wellheads and other subsea structures. Such methods must allow for tidal range, subsea currents, inherent buoyancy and variable weight. Critical in securing a solution is the method of holding or clamping equipment in place. The demands this places on existing technology and design methodology – and the resulting solutions – is illustrated in the development of a TAPB piggyback clamp system designed to allow the development of the pioneering Laggan Tormore project off the Shetland Islands by Subsea 7. During the installation and operation of pipelines a secondary line is sometimes introduced, attached to the main pipeline using a piggyback system, to provide adequate support. The Laggan Tormore project required the simultaneous installation and long term subsea deployment of 140km of a primary eight-inch diameter pipe with a secondary two-inch pipe attached or ‘piggybacked’ on top of it. This involved RED Engineering developing a new, semi-automated clamp and installation system in less than 12 months. This increased installation rates from 200m/hr to 1200m/hr while generating savings of several million dollars due to tumbling installation times. The existing method of attaching a piggyback line to a primary pipeline was via rubber blocks and steel bands, manually installed by a team of offshore technicians. It also required six operators and was potentially dangerous with incidents being recorded where operators caught clothing or fingers in the tightened steel bands. This was both an unreliable and hazardous method. It was clear to Subsea 7 that it was not feasible to install a 140km piggyback line using this technology. The solution to the challenge was a phased development program built around three fully integrated elements. 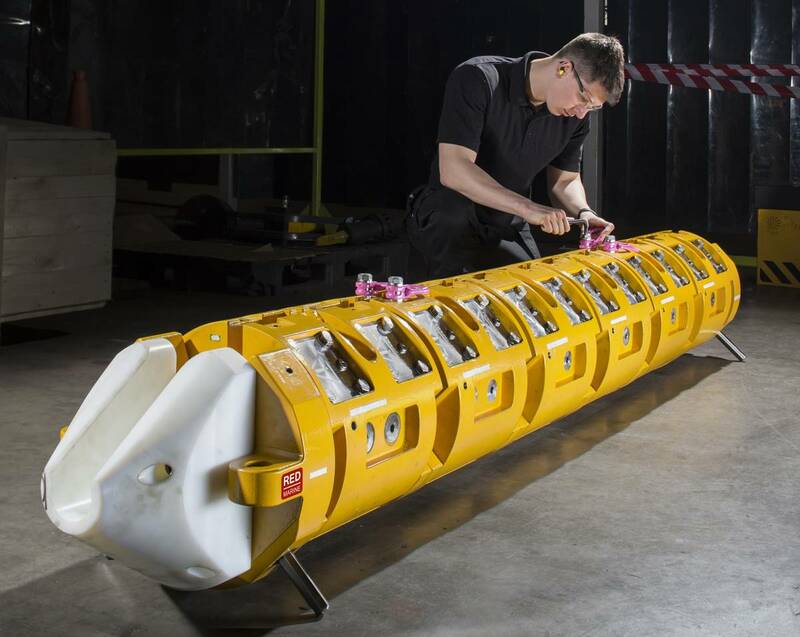 The creation of a new piggyback clamp arrangement required extensive research, development and testing to ensure a clamp that was robust enough to be installed without cracking, would provide a secure fastening and would survive long-term subsea immersion. The second stage involved the development and manufacture of a first-of-kind machine capable of fixing the blocks to the pipelines while they were in motion before completion of the final stage. This involved engineering support for the installation, commissioning and operation of the equipment on the Seven Oceans pipelay vessel which is capable of rigid and flexible pipelay in water depths up to 3,000m. The installation of the 140 km pipelines was completed in February 2013 with the deployment of approximately 17,500 individual clamps. In operational terms, pipe lay speeds of over 1,100 m/hr were achieved - more than five times faster than the traditional banding method. The economic benefits of this technology approach are clear: as a pipe-lay vessel can cost in excess of $300,000 a day, so the increase in lay speed generated a savings of several million dollars. 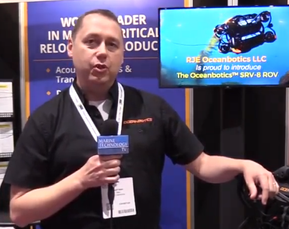 Three patent applications were subsequently lodged by Subsea 7 to protect this innovative technology. Another area to benefit from the latest in fast track design and engineering innovation is around the economic, safe and efficient servicing and maintenance of subsea oil wells in deep water. 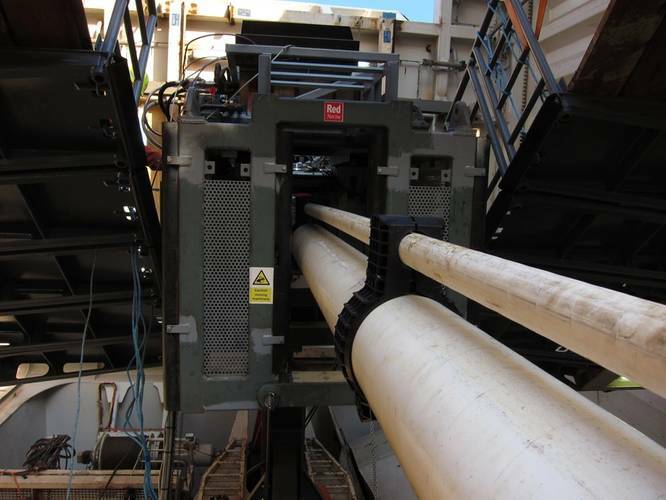 When FMC was developing its new vessel-based well intervention system, a requirement was identified for a subsea umbilical clamp as part of the equipment spread to securely ‘hold back’ a compressible control umbilical cable deployed to operate subsea hardware. 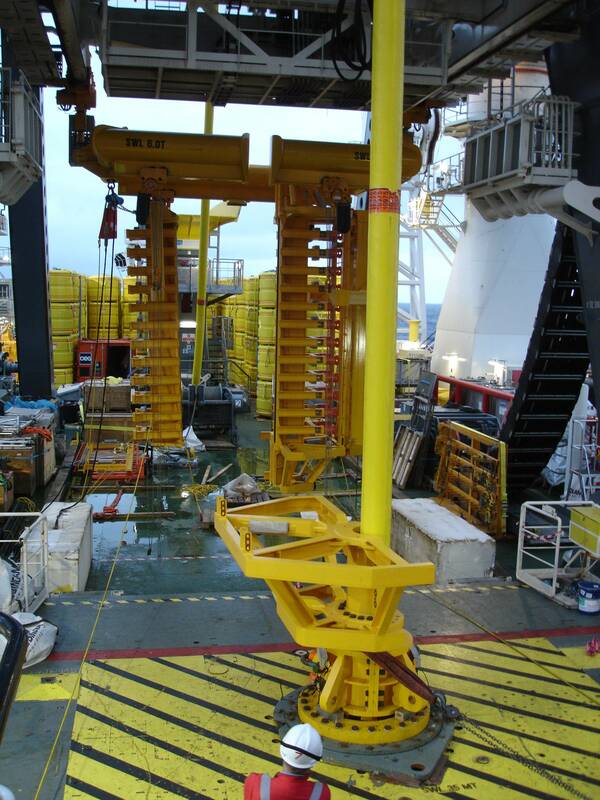 The key component of a subsea well intervention system is a complex ‘stack’ deployed from a support vessel and docked with a subsea wellhead, and usually operated via a control umbilical. Following a review of the proposed operations, analysis revealed that a subsea hold back clamp was required to support the umbilical from the vessel while completing intervention operations over an extended period. This threw-up a particularly challenging requirement as the umbilical cable was compressible and because it comprised of a series of cables and hoses (electrical, fiber optic and hydraulic) couldn’t be squeezed excessively when clamping to avoid internal damage. In addition, because the umbilical cable was grease-filled it might have leaked on compression, immediately reducing the external friction properties of the cable. In short, the challenge was to design and engineer a clamp system that could generate a holdback force of up to 26t while gently gripping a fragile, compressible and greasy 61mm diameter cable. A clamp solution, featuring an innovative arrangement of spring-applied pads to give a consistent squeeze pressure over a 3m length without resorting to a more complex electrohydraulic system, was designed and commissioned in less than seven month. Key to the success here was prior knowledge of the friction properties of subsea cables and the ability to quickly test and validate a potential solution. Without the umbilical hold-back clamp it would not be possible to complete vessel-based riser less well intervention operations in deeper water as the steel armored umbilical cable used to control the subsea equipment would be at risk of failure. The alternative would be to use a much more expensive offshore drilling rig with a riser-based intervention system. The clamp has therefore enabled FMC to offer deep-water well intervention services at a more attractive rate, giving them a competitive advantage in this field and cutting the cost of subsea oil and gas production. Full scale qualification testing is another critical challenge in subsea infrastructure design and fast track engineering solutions. This can be exemplified in another RED Engineering project to design tether clamps for the installation in the Gulf of Mexico, the world’s deepest offshore oil and gas development to date. The requirement for the tether clamp was driven by the need to securely fasten a fragile and compressible control umbilical to the seabed in over 2,900m of water for the lifetime of the development. Several difficult challenges that had to be overcome if the success was to be achieved. Also, in parallel to the design effort, a test program, which required the development, design and operation of a bespoke test rig, was completed to model and assess the exact behavior and friction properties of the installed umbilical cable. The development of a suitable clamping mechanism had to cater for the fact that the umbilical cable changes diameter during installation and a compliant clamp mechanism had to ensure application of a consistent clamping force, allowing correct retention of the cable during installation and at full operating depth. A tension mechanism using 24 x 1.8m long titanium bars was developed to apply a spring tension to the pads that gripped the cable. This ensured cable retention as it shrank under hydrostatic pressure during deployment to full water depth. Titanium rods were selected for the compliance mechanism as they are corrosion resistant, lightweight and have the correct elasticity properties. This also had to be verified by testing during the development of the clamp as this was a first-of-kind application. Given the prolonged deployment of the clamp, an additional system was developed to allow the titanium rods to be re-tensioned subsea by a ROV (remotely operated vehicle) if it was observed that the grip on the cable was declining over time. To test the performance of the clamp ahead of delivery to Subsea 7 (the subsea installation contractor), a specially designed test rig at RED Engineering’s test facility in the North east of England allowed the clamps to be fitted to a cable sample before it was pulled with a force of 126t over a 24-hour period to check for any slip. The project timescale allowed only 20 weeks to engineer, build and test the two-clamp systems, which has now been installed. Once operational a peak production of 50,000 barrel of oil equivalent (BOE) per day for first phase of development is estimated. Without these clamps, it would not have been possible to access a recoverable reserve of approximately 250 million BOE. There’s no doubt that as oil and gas reserves become more difficult and costly to recover, the demands for innovative technology will continue to grow, providing opportunities for companies like RED Engineering, who have grown-up on the back of innovation and engineering excellence, to show their capabilities. Investment in new technologies and engineering talent alongside experience gained working around the world for international operators, will continue to secure a strong position and reputation for oil and gas service expertise and knowledge in the times ahead. Joe Orrell is managing director at RED Engineering.